The discussion around near field communication (NFC) is often framed as if mobile payments have been driving the car while other uses of the technology — mobile marketing, person-to-person information sharing, virtual fingerprints — are merely along for the ride. But increasingly, the conversation is shifting. Far from being a passenger, mobile marketing, along with consumer loyalty, will be in the front seat as well and will be critical in helping to drive the growth and adoption of NFC. That’s because while the idea of contactless payments is intriguing, there is increasingly an awareness that tapping a phone to pay for an item will not sell itself. To reach widespread adoption, NFC needs to provide real value for both consumers and merchants. As Brad Greene, the Senior Business Leader at Visa (s v), said at GigaOM’s Mobilize conference, the key is not in payments but the features layered on top that will convince consumers and merchants. And that’s most likely to come from discounts, daily deals and loyalty reward programs that can be activated through NFC technologies. For a longer look at my views on this, check out my GigaOM Pro report (subscription required). If people use their phones to pay for items, check in to stores for coupons and grab deals from NFC-embedded posters and use them as loyalty cards, it could provide critical data to retailers, helping them craft offers for users, tweak inducements, track sales and change their product lineups. That’s what can get retailers excited enough to make the investment in new point-of-sale terminals often needed to support NFC transactions. This is increasingly what the two big U.S.-based NFC platforms are focusing on. Isis, the joint venture with Verizon (s vz), AT&T (s t) and T-Mobile, was launched last year as a mobile payments system that could rival the credit card networks. But this spring, the carriers shifted gears. Instead of focusing on getting a slice of the payments, they opened up their platform to other credit card companies and banks and began talking more about the opportunity in delivering targeted offers to consumers. Isis has called it an acceleration of its original plan; it’s still expecting to generate revenues from payments, but its cut of payments won’t be as significant as when it was going to run its own network. Google (s goog) also unveiled its Google Wallet in May and said right off the bat that it wasn’t taking a cut of the payments transactions, perhaps as a signal to partners that it wasn’t going to compete for a share of payments revenue. Instead, it was focusing on combining Google Wallet with Google Offers to help advertisers and retailers reach customers with personalized offers that could be redeemed through their phone. 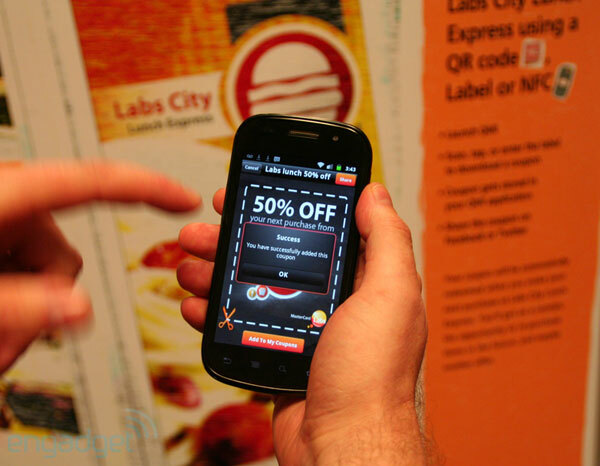 In both cases, consumers will be able to find discounts that are redeemable through an NFC payment. That will help retailers strengthen their relationships with their consumers by providing them with more customer data and allowing consumers to embed their loyalty cards into these digital wallets. NFC then becomes more of an exchange of discounts and deals rather than a simple cash replacement. For a longer look at this topic, check out my GigaOM Pro report (subscription required). http://www.macrumors.com/2011/10/31/apple-retail-stores-to-allow-self-checkout-via-ios-app-for-accessory-purchases/ Apple is simply using an App & the iTunes account to enable mobile payments for physical goods. This is similar to Starbucks using an app & barcode to make a payment for a cup of coffee. The beauty of using an app is it enables a rich two way relationship between the company and the customer for loyalty and other push offerings. If the fees on the use of an iTunes account for physical good purchases are reasonable, Apple stands to disrupt mobile payments without the complexity of NFC. I agree with all the other commentators. The business model for NFC as a payments vehicle on its own doesn’t stack up, except perhaps for rapid transit. Although, I find that sticking my Oyster card to my phone does the same thing when I use the tube (I’ve also heard that Transport for London found NFC “too slow” compared to Oyster, but that may be an urban legend!). I can see it being taken up by by the large retailers, stadiums and concert halls as a marketing, discounting and ticketing channel. But how would it be of benefit to very small businesses? Agreed, and I’ve been saying that for a long time, that at least half of all nfc interactions will be for non payments. (Yet NFC or contactless have been slow to get adopted due to payment-related power struggles). This article is right on; the big opportunity in mobile payments is for Cost-Per-Action (CPA) marketing, not the payment fees. I made the same point in my comments on RetailWire’s discussion on Google Wallet yesterday (http://www.retailwire.com/discussion/15583/consumers-can-take-googles-wallet-to-stores). My comment, along with my other RetailWire posts can be found here: http://www.retailwire.com/blog/130940/ben-sprecher.